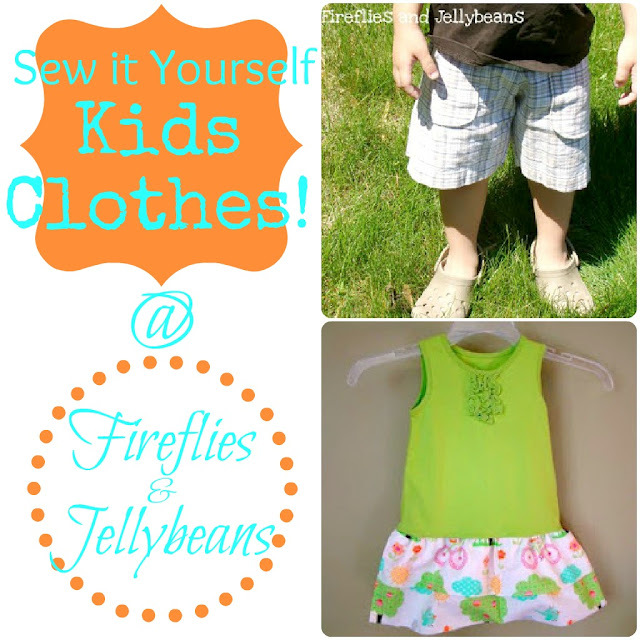 Fireflies and Jellybeans: Sew It Yourself Series - Tutorials Needed! I am excited about this new series, Sew It Yourself: Kids Clothes! During the month of June F&J will be showcasing tutorials of kids clothes! I have some fun girly ones and studly boy ones too! But we NEED your Help! We want to show off YOUR kids clothes tutorials. Email me (firefliesandjellybeans(at)gmail(dot)com) if you are interesting in contributing to this fun series! I am looking for tutorials with step-by-step directions and photos of KIDS clothes. Sounds fun right?! I am also thinking of other fun Sew-it-Yourself series like: Purses/Totes, Mom clothes, Christmas gifts... oh the possibilities! :) I am SO EXCITED! I have a skirt one I can show you! And I'm working on a dress right now! I'll finish and email you both in a few days! Very cool idea!